Have you tried the new Stuffed Crust Deep Dish Pizza from Little Caesars? It is really good, and it is one that of course my whole family can agree on. They all love the cheesy stuffed center, and the deep dish crust. The pizza is pretty amazing! The Little Caesars Deep Dish Pizza with Stuffed Crust is only $10 for a large, and it is filling. You add a salad maybe some fresh fruit and Crazy Bread you have a perfect fast hot and ready meal. Now for the fun part of hearing all about this fabulous pizza! 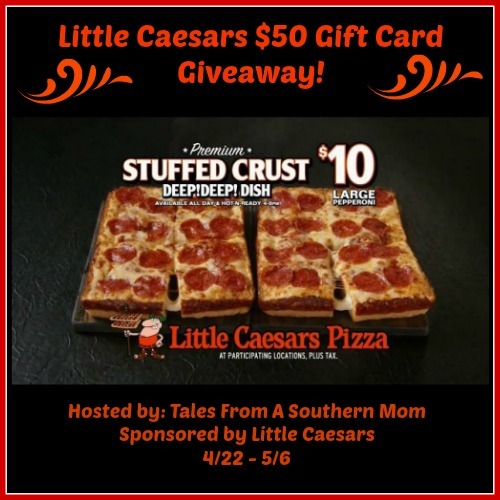 They are giving away a $50 Gift Card to Little Caesars so you can have the whole gang over and enjoy this Stuffed Crust Deep Dish Pizza!